Dietary Supplement Recommended by Gastroenterologists for Over 30 Years 100% Pure Natural Fiber For Gastrointestinal Health & Digestive Regularity* 100% Pure Concentrated Psyllium Fiber so You Only Need Two Serving a Day Dissolves Instantly Safe for Diabetics 81 Teaspoon Servings For Heart Health Diets low in saturated fat and cholesterol that include 7g of soluble fiber per day from psyllium husk, as in Hydrocil® Instant, may reduce the risk of heart disease by lowering cholesterol. 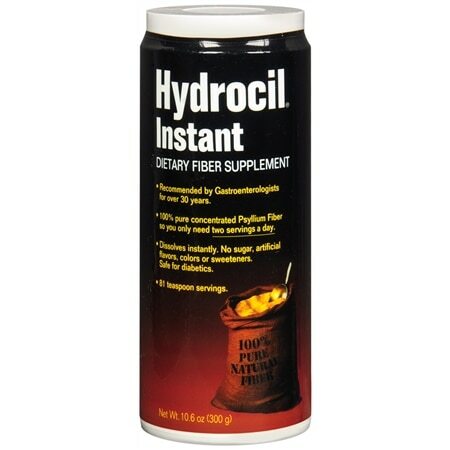 One serving Hydrocil Instant has 2.4g of this soluble fiber. No Sugar, Artificial Flavors, Colors, or Sweeteners 1-800-331-0221 *These statements have not been evaluated by the Food and Drug Administration. This product is not intended to diagnose, treat, cure, or prevent any disease.